Nielsen Music has just released its 5th annual study that offers a goldmine of actionable data from a sample group of more than 1,500 nationwide. To access the full report with expanded insights, contact paul.shaver@nielsen.com; meantime, a 15-page summary highlighting some key data can be downloaded as a pdf file here. 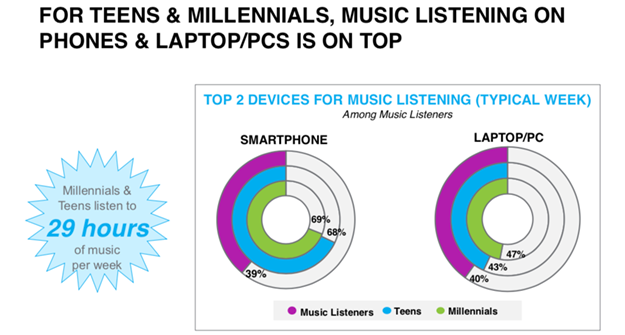 – 93% of teens and 91% of millennials are streaming music online, compared to 71% of all Canadian listeners. – Close to 70% of teens are listening using smartphones, 28% using tablets and 21% using branded headphones. 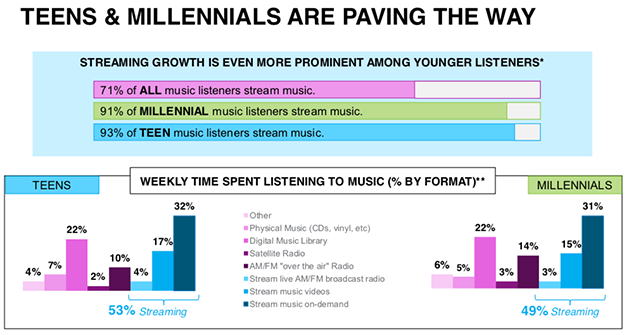 – Teens and millennials are equal in their adoption of paying for a music streaming service, at 34%. – Among all Canadian music listeners, 66% listen to the radio to discover new music, 43% report discovery on streaming services and 36% from acquaintances. –Terrestrial channels remain king, with 58% of music listeners listening to “over-the-air” radio at least once in a typical week (including 70% of listeners aged 45-54). – Digital radio has limited penetration, with 7% of listeners tuning in in a typical week, and 6% streaming live broadcast radio from an app or website. Part of that relatively low adoption may be due to wireless-carrier contracts: 43% of the sample group said they would be interested in listening to AM/FM radio on a smartphone if it had no impact on their data plan.